The Arizona Supreme Court is poised to release its full opinion on striking the Invest in Education Act from the ballot on Friday. Chad Heinrich, the new state director of the National Federation of Independent Business, was a farm boy who dreamed of being a bureaucrat. 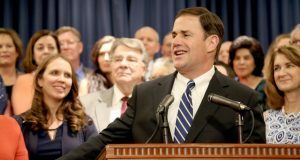 Arizona’s public education system could use more money– a point few argue against. The disagreement comes when elected officials and education advocates start talking about how to get there.